Earn 5 points per dollar when you make payments on season tickets. Earn 100 points per seat scanned at the gate for attending a game. Earn points for connecting your Twitter and Facebook accounts to Wild Rewards. Earn 100 points per Road Game Bonus and Promo Code entered. Earn 5 points per dollar on all retail and food & beverage purchases. Keep an eye out for unique events and opportunities to earn additional points. We want to acknowledge your contributions to Creating a Greater State of Hockey. 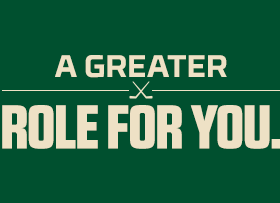 By volunteering your time to youth hockey associations & programs or bringing someone to their first Wild game, you have the opportunity to earn Wild Rewards bonus points. Visit our Wild Rewards FAQ page to find out additional details on how to earn.